Forrester’s recently released Now Tech: Email Marketing Vendors, Q3 2018 report provides an overview of 38 technology vendors in the email marketing space. Such reports are always helpful to email marketers needing to stay on the cusp of innovation; they have been a mainstay in the industry for two decades. Now Tech is an especially good read, and one I’d highly recommend for any digital marketing leader. But why read this Now Tech report in particular? In the past, reports of this type typically served as a guide for email marketers seeking a new email service provider (ESP). Or in other cases, simply to confirm that a previously chosen ESP remained relevant. This time, Forrester is offering email marketers something new to consider. Now Tech is the first formal report written by a leading analyst firm that acknowledges the accelerated pace of innovation in the industry by creating an entirely new class of email marketing vendor: The Email Content Personalizer. I’ll refer to these companies as ECPs. It’s hugely validating to see a leading industry analyst, Shar VanBoskirk, place her name and Forrester’s analysis behind the creation of this new category. I’d encourage you to check out the report just so you can see exactly where ECPs fit into the ever-evolving martech landscape. E is for Email. ECPs have a focus and strength on the email channel in particular. While much of the industry’s technological development over the last decade has focused on integrating email into multi-channel marketing programs, ECPs have developed special best-of-breed technology that plug into the email tech stack, helping elevate the performance of email marketing as the channel struggles to remain relevant in an environment of hyper-channel fragmentation and dwindling consumer attention spans. C is for Content. ECPs use technology to change the content within email messages vs. focusing on the delivery of email itself. They provide sophisticated content management capabilities that allow marketers to apply complex rules or machine-learning systems to render the right content for each email recipient. P is for Personalization. ECPs like Liveclicker use advanced personalization “hooks” to ingest data from any channel at the time an email is opened, and then render personalized experiences using that data for the consumer. For example, marketers can use open-time device detection to power experiences like in-email video or advanced interactive capabilities like the TOMS example. At the same time, data from a marketer’s website or other martech systems can be accessed in real time to keep email messages as relevant as possible. I hope you enjoy reading the Forrester Now Tech report as much as I did. It includes an introduction from Liveclicker that highlights many innovative email approaches. 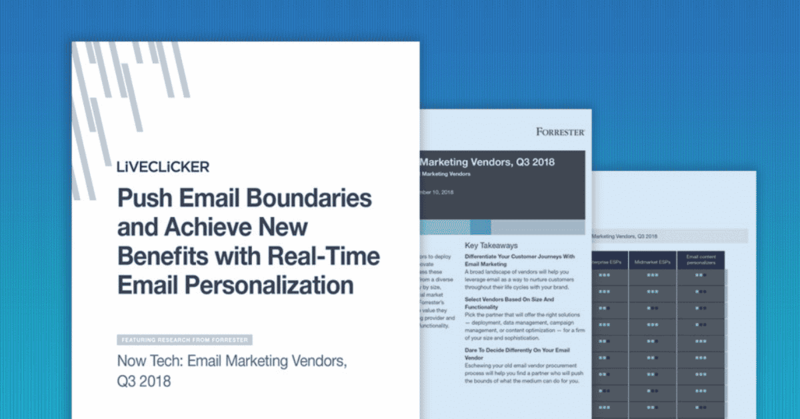 It also provides Forrester’s insights into the email marketing vendor selection process as well as a closer look at specific providers who are currently providing content personalization in emails delivered through ESPs. ⟵DIY Kinetic Design is Finally Here! Justin Foster is an entrepreneur specialized in online marketing and eCommerce. Passionate about helping businesses deliver 1:1 consumer experiences, Justin leads Liveclicker and the company's initiatives to help clients drive measurable benefits from real-time email personalization. In his career, he has founded the Video Commerce Consortium, the industry's largest trade group devoted to advancing the use of video in eCommerce and also the Email Marketing Roundtable, an industry group representing more than 1,500 email marketers worldwide. Prior to Liveclicker, Justin led the services practice for WhatCounts, an email marketing technology provider, where he was responsible for client strategy and development. Justin holds a Bachelor of Business Administration from Pacific Lutheran University with emphasis in Information Science and Entrepreneurship and a minor in Chinese from Beijing Foreign Studies University.